Josie – (decreased) a small standardbred mare. We spent considerable time together when I was a teenager. I learned in working with her that at some point in life there would be other horses in my life. 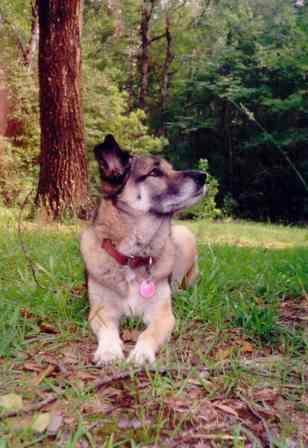 Bootleg – (deceased) a brown and black wolf/husky mix. Pete and I got Bootleg in 1986. Our mutual love and concern for her strengthened our love and concern for one another. Rainbow—(still here) a multi-colored Montana Cattle dog with all the markings. She came into Pete and my life in 2002. I cannot speak for Pete, but she taught me to respect those animals who quite clearly have their own agenda. Raudi – (still here) a chestnut mare with a lighter mane and tail. Raudi has taught me many things, one of the most important being the importance of trust in all relationships. Peaches—(deceased) a cream colored Oberhasli/Saanen cross goat. Peaches taught me to be centered. Ranger, Rover--(still here) Rover is chocolate with white markings. Ranger is tan with a dark stripe running down his back. They have impressed upon me the fact that, indeed, love is unconditional. Tinni—(still here) black gelding, no markings. This forever horse has repeatedly reminded me that love for horses should be unconditional. Stubbi, Catchi, Henny Penny Palin, Nimby, Snooky, Henrietta. (deceased) – chickens all of varying breeds and colors. Verified, that I have a strong maternal instinct. Freebird and Chickaroo. (still here) Freebird, black and Chickaroo, red-orange. I have discovered in caring for these two birds the importance of keeping a promise. I have this winter, thus far, told them that when spring comes, they will have plenty of outdoor time. I intend to keep this promise. Signy (still here) Bay mare with a black mane and tail. Now, after spending considerable time with Signy, I have come to see the importance of being less effusive. Hrimmi (still here) Chestnut Pinto mare with a thick red mane and a multi-colored tale. We fretted before she was born about how things would go after. Her subsequent presence is a reminder that things have a way of working out just fine. Ryder (still here) Black and white border collie with amber colored eyes. The importance of cutting loose and having fun. Mr. Siggi (deceased) blue dun gelding. Jury’s out. He’s no longer with us, but I am still learning a great deal from him.